The episode began with the main male character, Daikichi, waking up after a dream of an older man walking a younger girl. Thinking that it might have been his grandfather, he talked about how that man died recently as he got ready to head to the funeral. Being pretty laidback but still gruff the entire time, he walked through the gates of his grandfather's house and had his first encounter with Rin, the main female character. The rest of the family, important or not, got introduced randomly. Daikichi met with his mother in the kitchen, who talked about Rin being her father's illegitimate daughter (I only know from the manga that she's 6 years old), and Rin's mother having disappeared. Daikichi's sister, seeming like a typical haughty office lady, snidely commented that he didn't even come home for the holidays, and there were glimpses of Daikichi's various uncles (as well as his grandfather's younger brother). As the family prepared for the funeral, Daikichi's niece (Reina) showed up. She seemed to be around the same age as Rin, and was markedly far more spoiled. 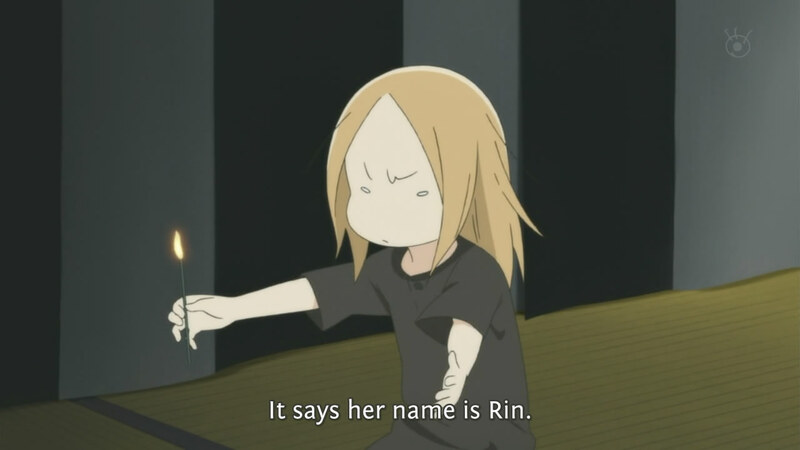 She ran around the house screaming and yelling, whereas Rin lit incense every once in a while to keep with tradition. I'm pretty sure Reina was shown specifically to show Rin's maturity, as she was loud and didn't want to keep with customs (wanting to create a field of flowers instead of gently placing a flower down, for one thing). There is apparently a tradition of keeping an incense lit through the night for the deceased; this I did not know. Either way, Daikichi sent his uncles off to bed (since they were already asleep) and stayed to watch the incense himself. 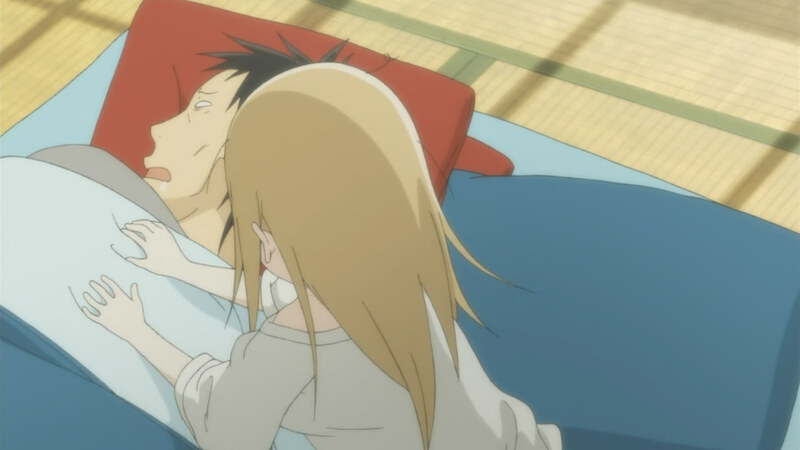 Rin was in the corner of the room, struggling to stay awake, and Daikichi prodding her to go to bed resulted in her sleeping on his hand. At least the bonding was shown from the very beginning. 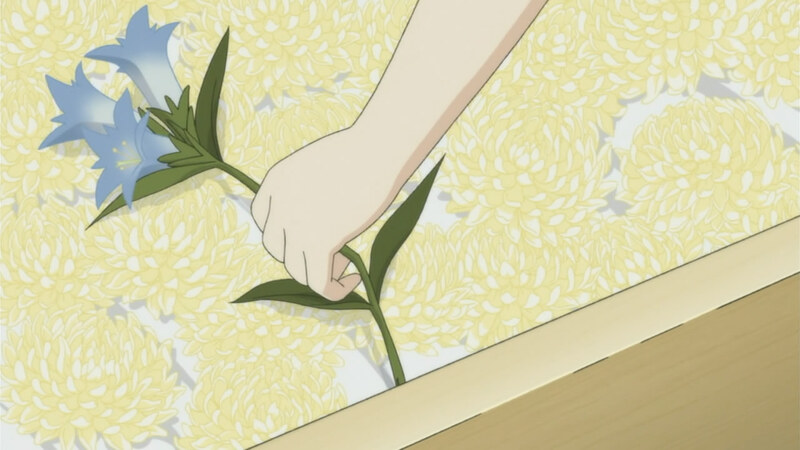 The final goodbyes to the grandfather (where Reina played around with the flowers) caused Rin to "misbehave", running out to the garden to pick different flowers to play in the coffin instead of the ones provided (since the grandfather had liked those better). Daikichi understood, knowing that those flowers were his grandfather's favourites, but obviously the rest of the family was still uncomfortable. 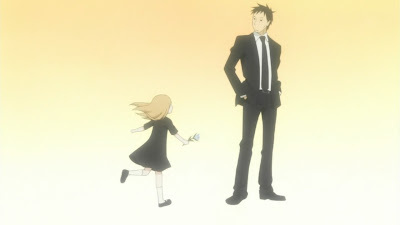 The scene after the funeral was incredibly touching, when Rin got a stool and attempted to reach the clock on the wall in order to wind it. Being too short, Daikichi reached out and did it for her. These little details always touch me. 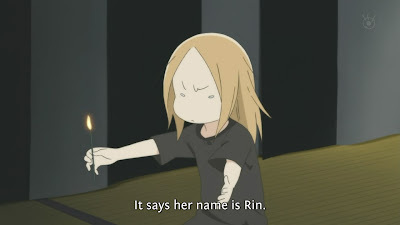 The climax of the episode was after the funeral had finished, where the family sat together to come up with excuses on why they couldn't take care of Rin. 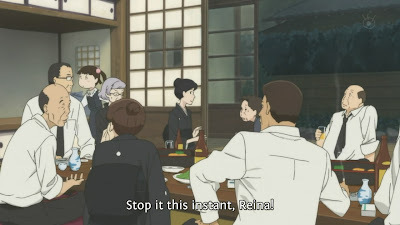 Right before this, Reina was being rather loud with Daikichi, badmouthing Rin in the way the only children can ("She still has her baby teeth! 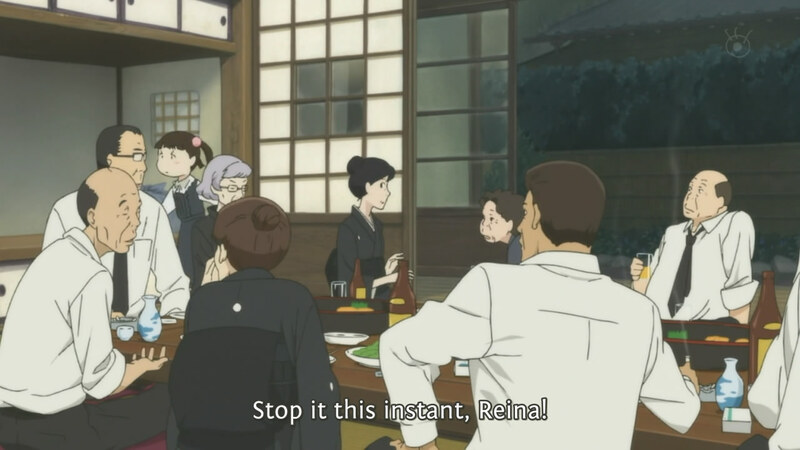 "), causing Daikichi to respond that Reina was annoying, not Rin. 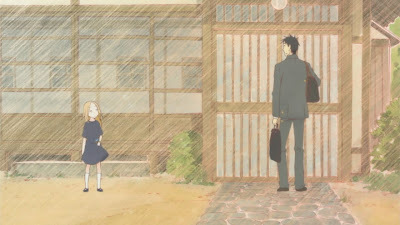 In pretty terrible manner, the family spoke about how they couldn't take care of Rin - but perhaps they could consider it if she was better-behaved and was more inclined to speak - and then about how they weren't even sure that she was really a daughter of the family. (Seriously, there are tests for that. Hearsay in these matters is just disgusting.) Daikichi snapped when they talked about putting her in a facility (orphanage?) and ventured out into the yard to ask if Rin wanted to live with him. Why does he sleep like the dead? 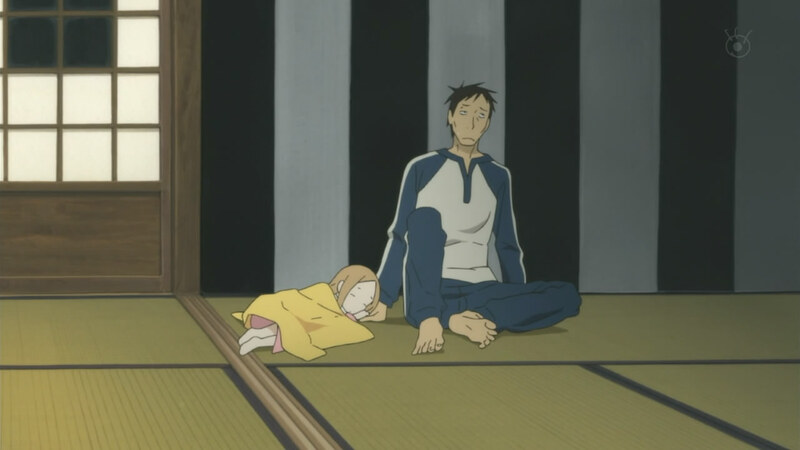 Their first day together was obviously difficult, with Rin having to share Daikichi's futon and having to wake him up to remind him that she needed food. After the ED, there wasn't enough when she wanted seconds and so she made onigiri with only salt rather than with fillings. 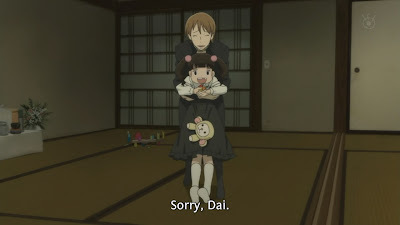 Remembering that she struggled to cry before (and then did cry when she found out that the grandfather wouldn't be "waking up" any more), there will obviously be more coping in the episodes to come (along with Daikichi's handling of single parenthood). 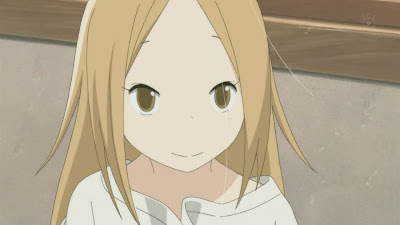 She looks like Nino from Arakawa. There's a completed manga about this, with 9 volumes (51 chapters). After watching the first episode, I really do want to know what happens, but I'll stop myself and let the anime present it to me. If I'm left unsatisfied (like with Kimi ni Todoke S1), I'll go and grab the manga. For now, I'm perfectly content feeling happily sad one week at a time.